It has been said that a person must be judged by the works he accomplished while he was alive. If this is the bar to measure against, then Dr. Hal Huggins was a giant among men. And, if self-sacrifice for a cause is thrown in for good measure, then he had no equal in his field. Dr. Huggins dedicated the latter part of his life to a cause he had no inkling existed when he attended Dental school at the University of Nebraska and practiced dentistry in Colorado Springs, Colorado. He was the golden boy of the America Dental Association or ADA, the trade association that represents dentists, giving presentations throughout the country and teaching about blood chemistries, which he held a post doctorate degree in from the University of Colorado. Then, one day, he ran into Olympio Pinto, an M.D. from South America, and his world changed. After Dr. Huggins gave a talk at a convention for the ADA, Olympio pulled him aside and shared with him his findings that the mercury in Amalgam fillings leaked out and caused diseases in patients he had in Brazil. “Impossible,” Dr Huggins countered. ”If they were dangerous, then the ADA would not allow them to be used at all.” He dismissed the idea, but invited Pinto to show him his findings that evening in his hotel room to review the evidence. That day changed Dr. Huggins’ life forever. It turned out that dental amalgam fillings, which contain 50% mercury, did leak. 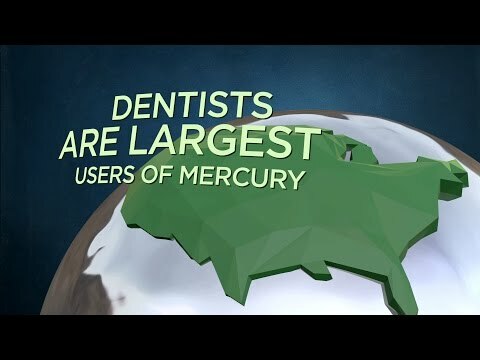 Sadly, the toxicity of mercury is very well known and documented – it is the most deadly non-radioactive metal on earth. And dentists were routinely planting, in our mouths, without warning or informing us, hundreds of millions of them every year. The scope of it horrified Dr. Huggins. He wanted to do something about it. He approached some top officials he knew in the ADA and presented his findings, which he was sure they would welcome and start alerting dentists and warning patients. The ADA had no intention of even considering that amalgams were dangerous. And for a simple selfish reason. Liability. They promptly disinvited him from any further ADA talks, and started a thirty-year campaign to methodically attack, discredit and ultimately destroy him. Dr. Huggins was a unique individual. He actually cared more for patients than his own standing in the ADA. More importantly, he knew that amalgams were crippling people every day, and the more he researched, the more he realized that the mercury that leaked out of the fillings was at the root cause of ALS, MS, and a host of other debilitating diseases. He was unique in another way. He would not be silenced or back down. Ever. That was the beginning of Dr. Huggins journey. He continued to practice dentistry without mercury fillings, and pioneered the safe removal of amalgam fillings. He wrote dozens of books, including the groundbreaking title It’s All in your Head, hundreds of articles, and gave thousands of lectures outside of the ADA, to warn dentists of the dangers and to train them to fix the damage that had already been done. In this regard, he founded the Multi-Discipline Alliance of Professionals, an organization that continues to teach dentists his techniques. Then another chance event happened. A knock on his front door. Outside, a man had two trunks. He said that a dentist named Weston Price had left them in his care decades earlier before he died. He was told to give them to someone who would get the information out. Weston Price was the head researcher in the early 1920’s for the now defunct National Dental Association or NDA. In those trunks were the fruits of all of his research. The man told Dr. Huggins that he felt he was the person he should give them to. That night, Dr. Huggins read through them, and broke down crying. Root canals, Dr. Price had shown, were deadly – more deadly than anyone had believed. He showed, for example, that a root canal tooth from a person who died of a heart attack, implanted into a rabbit, also produced a heart attack in the rabbit. It was considered impossible. And yet, there were thousands upon thousands of pages, pictures, tests and research that proved it. And not only heart attacks. Arthritis, breast cancer and many other diseases. To make matters worse, and more personal, before he knew of the dangers, Dr. Price performed a root canal on his own son, who died because of it. Not surprisingly, the NDA did not welcome Dr. Weston Price’s research as openly as he had hoped. In fact, they created the playbook of disinformation and attacks that were later used on Dr. Huggins. Root canals were the next big thing that dentists could make money with. They weren’t about to allow hard scientific research to get in the way of those profits. He was vilified and discredited. He hid his research and hoped, one day, it would finally get out to the public. Dr. Huggins made sure it did. And he received help from an unexpected source. One of the founders of the orthodontic society, Dr. George Meinig, read a book that Dr. Huggins had published about root-canals and the danger they posed. Upon his studying the research, he came to the same conclusion: root canals were deadly. Dr. Meinig, by the way, had recently received an award as one of the original founders of the orthodontic division of the ADA, and given a plaque for his service. He was the recipient of numerous awards and citations nationally and internationally. Once he rang the alarm, however, that changed. He was vilified by the ADA and called a quack. Undeterred, Dr. Meinig wrote a book called The Root Canal Cover up, and continued to support Dr. Huggins’ relentless campaign to inform the public and dentists of their dangers until his death. One central question consumed Dr. Huggins the last fifteen years of his life: how could root canals, first of all, create diseases in humans and, more importantly, cause the same disease in animals as humans. There could be only one answer. The cause of the diseases were contained within the root canal. He tried replicating Dr. Price’s tests, and was not successful. He later learned the reason: Dr. Price used root canal teeth within minutes of extraction. Dr. Huggins was sending them to a lab in Redmond, Washington, sometimes taking days. He took another approach. He swabbed the extracted root canal teeth when he received them and found they contained dozens of deadly anaerobic bacteria. He purchased DNA testing equipment, got it certified, hired a lab technician, and started testing in earnest. The results shocked him. Deadly bacterial DNA found in ALL root canal teeth extracted. He wrote more articles and books to warn about the dangers. The ADA continued to vilify him, to no avail. They even tried to criminally prosecute him. Then, an unexpected twist came to his attention. A new technique and procedure dentists were using to try and get around the use of root canals. He started to test the DNA from swabbed dental implants. In his words to me, if root canals are deadly, then dental implants are one-thousand times as deadly. He was seeing anaerobic bacteria he never expected to see. One was so deadly it had not yet been classified. He named it the RockyTox. He was convinced that with scientifically validated DNA tests the dental community, and the ADA, would finally have to accept his findings and act accordingly. Sadly, he was wrong again. They did not. He died November 29th at the age of 77, as courageous as ever and fighting until the end. He left the final book of his career, the danger of dental implants, partially completed. He entrusted me to finish it, which I will do soon. Throughout his career, Dr. Huggins never tired of his fight for the truth. Every time he was knocked down by those in a position of power in the medical or dental industry, he dusted himself off and got right back up. Luckily for us he did. Those in power had not counted on his tenacity. By all accounts, he was a giant among his peers. He never wavered from what he knew to be the truth, and always kept his focus on helping people in any way he could. He will truly be missed by all who knew him, and by future generations who, although never knowing him, will hopefully be better off from all of the personal sacrifices he bore in his quest to get the word out regarding the dangers of dental amalgam, root canals, and especially dental implants.